“The amount of information gathered from users,” explain Facebook programmers Justin Voskuhl and Ramesh Vyaghrapuri in their patent application, “is staggering — information describing recent moves to a new city, graduations, births, engagements, marriages, and the like.” Facebook and other so-called tech companies have been warehousing all of this information since their respective inceptions. In Facebook’s case, its data vault includes information posted as early as 2004, when the site first went live. Now in a single month the amount of information forever recorded by Facebook —dinner plans, vacation destinations, emotional states, sexual activity, political views, etc.— far surpasses what was recorded during the company’s first several years of operation. And while no one outside of the company knows for certain, it is believed that Facebook has amassed one of the widest and deepest databases in history. Facebook has over 1,189,000,000 “monthly active users” around the world as of October 2013, providing considerable width of data. And Facebook has stored away trillions and trillions of missives and images, and logged other data about the lives of this billion plus statistical sample of humanity. Adjusting for bogus or duplicate accounts it all adds up to about 1/7th of humanity from which some kind of data has been recorded. According to Facebook’s programmers like Voskuhl and Vyaghrapuri, of all the clever uses they have already applied this pile of data toward, Facebook has so far “lacked tools to synthesize this information about users for targeting advertisements based on their perceived income.” Now they have such a tool thanks to the retention and analysis of variable the company’s positivist specialists believe are correlated with income levels. They’ll have many more tools within the next year to run similar predictions. Indeed, Facebook, Google, Yahoo, Twitter, and the hundreds of smaller tech lesser-known tech firms that now control the main portals of social, economic, and political life on the web (which is now to say everywhere as all economic and much social activity is made cyber) are only getting started. The Big Data analytics revolutions has barely begun, and these firms are just beginning to tinker with rational-instrumental methods of predicting and manipulating human behavior. There are few, if any, government regulations restricting their imaginations at this point. Indeed, the U.S. President himself is a true believer in Big Data; the brain of Obama’s election team was a now famous “cave” filled with young Ivy League men (and a few women) sucking up electioneering information and crunching demographic and consumer data to target individual voters with appeals timed to maximize the probability of a vote for the new Big Blue, not IBM, but the Democratic Party’s candidate of “Hope” and “Change.” The halls of power are enraptured by the potential of rational-instrumental methods paired with unprecedented access to data that describes the social lives of hundreds of millions. Facebook’s intellectual property portfolio reads like cliff notes summarizing the aspirations of all corporations in capitalist modernity; to optimize efficiency in order to maximize profits and reduce or externalize risk. Unlike most other corporations, and unlike previous phases in the development of rational bureaucracies, Facebook and its tech peers have accumulated never before seen quantities of information about individuals and groups. Recent breakthroughs in networked computing make analysis of these gigantic data sets fast and cheap. Facebook’s patent holdings are just a taste of what’s arriving here and now. The way you type, the rate, common mistakes, intervals between certain characters, is all unique, like your fingerprint, and there are already cyber robots that can identify you as you peck away at keys. Facebook has even patented methods of individual identification with obviously cybernetic overtones, where the machine becomes an appendage of the person. U.S. Patents 8,306,256, 8,472,662, and 8,503,718, all filed within the last year, allow Facebook’s web robots to identify a user based on the unique pixelation and other characteristics of their smartphone’s camera. Identification of the subject is the first step toward building a useful data set to file among the billion or so other user logs. Then comes analysis, then prediction, then efforts to influence a parting of money. Many Facebook patents pertain to advertising techniques that are designed and targeted, and continuously redesigned with ever-finer calibrations by robot programs, to be absorbed by the gazes of individuals as they scroll and swipe across their Facebook feeds, or on third party web sites. Speaking of feeds, U.S. Patent 8,352,859, Facebook’s system for “Dynamically providing a feed of stories about a user of a social networking system” is used by the company to organize the constantly updated posts and activities inputted by a user’s “friends.” Of course embedded in this system are means of inserting advertisements. According to Facebook’s programmers, a user’s feeds are frequently injected with “a depiction of a product, a depiction of a logo, a display of a trademark, an inducement to buy a product, an inducement to buy a service, an inducement to invest, an offer for sale, a product description, trade promotion, a survey, a political message, an opinion, a public service announcement, news, a religious message, educational information, a coupon, entertainment, a file of data, an article, a book, a picture, travel information, and the like.” That’s a long list for sure, but what gets injected is more often than not whatever will boost revenues for Facebook. The advantage here, according to Facebook, is that “rather than having to initiate calls or emails to learn news of another user, a user of a social networking website may passively receive alerts to new postings by other users.” The web robot knows best. Sit back and relax and let sociality wash over you, passively. 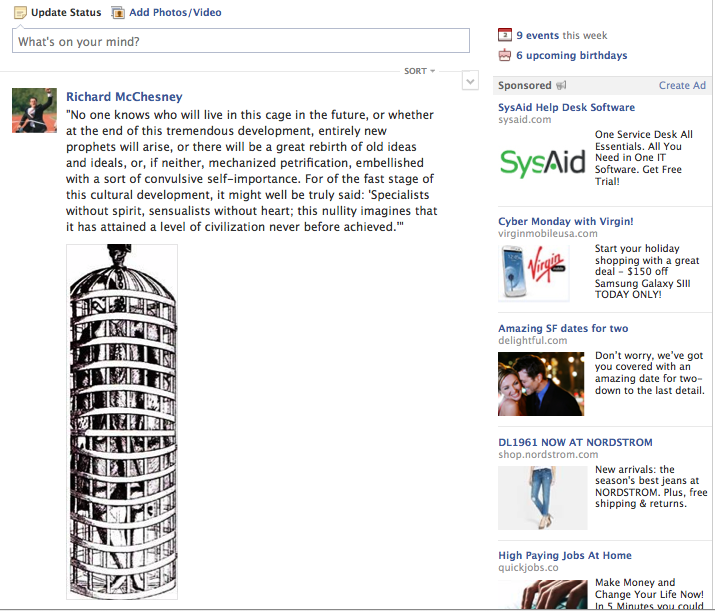 This is merely one of Facebook’s many “systems for tailoring connections between various users” so that these connections ripple with ads uncannily resonant with desires and needs revealed in the quietly observed flow of e-mails, texts, images, and clicks captured forever in dark inaccessible servers of Facebook, Google and the like. These communications services are free in order to control the freedom of data that might otherwise crash about randomly, generating few opportunities for sales. Where this fails Facebook ratchets up the probability of influencing the user to behave as a predictable consumer. “Targeted advertisements often fail to earn a user’s trust in the advertised product,” explain Facebook’s programmers in U.S. Patent 8,527,344, filed in September of this year. “For example, the user may be skeptical of the claims made by the advertisement. Thus, targeted advertisements may not be very effective in selling an advertised product.” Facebook’s computer programmers who now profess mastery over sociological forces add that even celebrity endorsements are viewed with skepticism by the savvy citizen of the modulated Internet. They’re probably right. Facebook’s solution is to mobilize its users as trusted advertisers in their own right. “Unlike advertisements, most users seek and read content generated by their friends within the social networking system; thus,” concludes Facebook’s mathematicians of human inducement, “advertisements generated by a friend of the user are more likely to catch the attention of the user, increasing the effectiveness of the advertisement.” That Facebook’s current So-And-So-likes-BrandX ads are often so clumsy and ineffective does not negate the qualitative shift in this model of advertising and the possibilities of un-freedom it evokes. Forget iPhones and applications, the tech industry’s core consumer product is now advertising. Their essential practice is mass surveillance conducted in real time through continuous and multiple sensors that pass, for most people, entirely unnoticed. The autonomy and unpredictability of the individual —in Facebook’s language the individual is the “user”— is their fundamental business problem. Reducing autonomy via surveillance and predictive algorithms that can placate existing desires, and even stimulate and mold new desires is the tech industry’s reason for being. Selling their capacious surveillance and consumer stimulus capabilities to the highest bidder is the ultimate end. Sounds too dystopian? Perhaps, and this is by no means the world we live in, not yet. It is, however, a tendency rooted in the tech economy. The advent of mobile, hand-held, wirelessly networked computers, called “smartphones,” is still so new that the technology, and its services feel like a parallel universe, a new layer of existence added upon our existing social relationships, business activities, and political affiliations. In many ways it feels liberating and often playful. Our devices can map geographic routes, identify places and things, provide information about almost anything in real time, respond to our voices, and replace our wallets. Who hasn’t consulted “Dr. Google” to answer a pressing question? Everyone and everything is seemingly within reach and there is a kind of freedom to this utility. Most of Facebook’s “users” have only been registered on the web site since 2010, and so the quintessential social network feels new and fun, and although perhaps fraught with some privacy concerns, it does not altogether fell like a threat to the autonomy of the individual. To say it is, is a cliche sci-fi nightmare narrative of tech-bureaucracy, and we all tell one another that the reality is more complex. Privacy continues, however, too be too narrowly conceptualized as a liberal right against incursions of government, and while the tech companies have certainly been involved in a good deal of old-fashioned mass surveillance for the sake of our federal Big Brother, there’s another means of dissolving privacy that is more fundamental to the goals of the tech companies and more threatening to social creativity and political freedom. Georgetown University law professor Julie Cohen notes that pervasive surveillance is inimical to the spaces of privacy that are required for liberal democracy, but she adds importantly, that the surveillance and advertising strategies of the tech industry goes further. “A society that permits the unchecked ascendancy of surveillance infrastructures, which dampen and modulate behavioral variability, cannot hope to maintain a vibrant tradition of cultural and technical innovation,” writes Cohen in a forthcoming Harvard Law Review article. “Modulation” is Cohen’s term for the tech industry’s practice of using algorithms and other logical machine operations to mine an individual’s data so as to continuously personalize information streams. Facebook’s patents are largely techniques of modulation, as are Google’s and the rest of the industry leaders. Facebook conducts meticulous surveillance on users, collects their data, tracks their movements on the web, and feeds the individual specific content that is determined to best resonate with their desires, behaviors, and predicted future movements. The point is to perfect the form and fuction of the rational-instrumental bureaucracy as defined by Max Weber: to constantly ratchet up efficiency, calculability, predictability, and control. If they succeed in their own terms, the tech companies stand to create a feedback loop made perfectly to fit each an every one of us, an increasingly closed systems of personal development in which the great algorithms in the cloud endlessly tailor the psychological and social inputs of humans who lose the gift of randomness and irrationality. “It is modulation, not privacy, that poses the greater threat to innovative practice,” explains Cohen. “Regimes of pervasively distributed surveillance and modulation seek to mold individual preferences and behavior in ways that reduce the serendipity and the freedom to tinker on which innovation thrives.” Cohen has pointed out the obvious irony here, not that it’s easy to miss; the tech industry is uncritically labeled America’s hothouse of innovation, but it may in fact be killing innovation by disenchanting the world and locking inspiration in an cage. If there were limits to the reach of the tech industry’s surveillance and stimuli strategies it would indeed be less worrisome. Only parts of our lives would be subject to this modulation, and it could therefore benefit us. But the industry aspires to totalitarian visions in which universal data sets are constantly mobilized to transform an individual’s interface with society, family, the economy, and other institutions. The tech industry’s luminaries are clear in their desire to observe and log everything, and use every “data point” to establish optimum efficiency in life as the pursuit of consumer happiness. Consumer happiness is, in turn, a step toward the rational pursuit of maximum corporate profit. We are told that the “Internet of things” is arriving, that soon every object will have embedded within it a computer that is networked to the sublime cloud, and that the physical environment will be made “smart” through the same strategy of modulation so that we might be made free not just in cyberspace, but also in the meatspace. Whereas the Internet of the late 1990s matured as an archipelago of innumerable disjointed and disconnected web sites and databases, today’s Internet is gripped by a handful of giant companies that observe much of the traffic and communications, and which deliver much of the information from an Android phone or laptop computer, to distant servers, and back. The future Internet being built by the tech giants —putting aside the Internet of things for the moment— is already well into its beta testing phase. It’s a seamlessly integrated quilt of web sites and apps that all absorb “user” data, everything from clicks and keywords to biometric voice identification and geolocation. United States Patent 8,572,174, another of Facebook’s recent inventions, allows the company to personalize a web page outside of Facebook’s own system with content from Facebook’s databases. Facebook is selling what the company calls its “rich set of social information” to third party web sites in order to “provide personalized content for their users based on social information about those users that is maintained by, or otherwise accessible to, the social networking system.” Facebook’s users generated this rich social information, worth many billions of dollars as recent quarterly earnings of the company attest. In this way the entire Internet becomes Facebook. The totalitarian ambition here is obvious, and it can be read in the securities filings, patent applications, and other non-sanitized business documents crafted by the tech industry for the financial analysts who supply the capital for further so-called innovation. Everywhere you go on the web, with your phone or tablet, you’re a “user,” and your social network data will be mined every second by every application, site, and service to “enhance your experience,” as Facebook and others say. The tech industry’s leaders aim to expand this into the physical world, creating modulated advertising and environmental experiences as cameras and sensors track our movements. Facebook and the rest of the tech industry fear autonomy and unpredictability. The ultimate expression of these irrational variables that cannot be mined with algorithmic methods is absence from the networks of surveillance in which data is collected. One of Facebook’s preventative measures is United States Patent 8,560,962, “promoting participation of low-activity users in social networking system.” This novel invention devised by programmers in Facebook’s Palo Alto and San Francisco offices involves a “process of inducing interactions,” that are meant to maximize the amount of “user-generated content” on Facebook by getting lapsed users to return, and stimulating all users to produce more and more data. User generated content is, after all, worth billions. Think twice before you hit “like” next time, or tap that conspicuously placed “share” button; a machine likely put that content and interaction before your eyes after a logical operation determined it to have the highest probability of tempting you to add to the data stream, thereby increasing corporate revenues. Facebook’s patents on techniques of modulating “user” behavior are few compared to the real giants of the tech industry’s surveillance and influence agenda. Amazon, Microsoft, and of course Google hold some of the most fundamental patents using personal data to attempt to shape an individual’s behavior into predictable consumptive patterns. Smaller specialized firms like Choicepoint and Gist Communications have filed dozens more applications for modulation techniques. The rate of this so-called innovation is rapidly telescoping. Perhaps we do know who will live in the iron cage. It might very well be a cage made of our own user generated content, paradoxically ushering in a new era of possibilities in shopping convenience and the delivery of satisfactory experiences even while it eradicates many degrees of chance, and pain, and struggle (the motive forces of human progress) in a robot-powered quest to have us construct identities and relationships that yield to prediction and computer-generated suggestion. Defense of individual privacy and autonomy today is rightly motivated by the reach of an Orwellian security state (the NSA, FBI, CIA). This surveillance changes our behavior by chilling us, by telling us we are always being watched by authority. Authority thereby represses in us whatever might happen to be defined as “crime,” or any anti-social behavior at the moment. But what about the surveillance that does not seek to repress us, the watching computer eyes and ears that instead hope to stimulate a particular set of monetized behaviors in us with the intimate knowledge gained from our every online utterance, even our facial expressions and finger movements? UC: A University, or a Biotech Company? Last month the University of California intervened in a high stakes U.S. Supreme Court case on the side of the agribusiness giant Monsanto Company by filing an amicus brief stating that the university would be harmed materially if Monsanto doesn’t prevail. 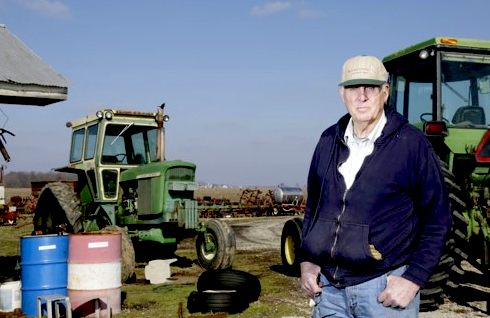 On the receiving end of UC’s legal argument is Vernon Bowman, a 75 year-old grain farmer from southern Indiana who has been battling Monsanto in court for several years now. It was already a David v. Goliath kind of fight, pitting an elderly guy in overalls against a global corporation with a bottomless pocket for legal expenses; the entry of UC into the court’s deliberations makes that two Goliaths. Monsanto alleges that Bowman stole from the company years ago when he purchased soybean seeds from a local grain elevator and planted them in his fields. The seeds were second generation crop from a previous year’s harvest, the original seeds of which had been purchased from Monsanto by a different farmer. This second generation seed stock was found to contain genes that made the soybeans resistant to glyphosate-based herbicides, known to the public as Roundup, making them “Roundup Ready” in Monsanto’s lexicon of trademarked phrases and proprietary industrial farming systems. Monsanto, after deploying agribusiness spies to detect the genes in Bowman’s fields, took the farmer to court. The handful of big biotech companies like Monsanto that dominate the trade in GMO seeds have prosecuted dozens of similar cases, winning nearly every time in lower courts, exhausting the legal resources of their opponents, and building support in case law for the idea that intellectual property ownership can extend into the very DNA of life, and that the legal owners of genetic “technologies” should have full control over the total reproductive power of the organisms they alter. Bowman is the farmer who fought back, all the way to the Supreme Court. On February 19 the Supreme Court heard oral arguments in Bowman v. Monsanto. The tenor of the discussion, which lasted for just over an hour, was decidedly hostile to Bowman and his counsel, letting the lawyers from WilmerHale, Monsanto’s billion dollar law firm, sit back and relax. Chief Justices Roberts, Scalia, Breyer, and Ginsberg interrogated Bowman’s lawyer, often with obvious contempt in their voices, as he struggled to lay out an argument against Monsanto’s interpretation of US patent law. Under the law, Monsanto seems the clear favorite to win. US property laws have been molded for over two centuries by a profoundly anti-social doctrine emphasizing private control over technology and the financial gains to be made from invention. What’s relatively new is the extension of these propertarian doctrines into the essence of life itself, but thus far the courts and legal profession haven’t allowed the contradictions inherent in this obstruct their valorization of capital over life. The University of California’s intervention is a big deal, even if it was to be expected. UC’s amicus brief (which was actually spearheaded by a Wisconsin university research foundation) was co-signed by other schools that have close ties to big agribusiness such as the universities of Iowa, Illinois, Florida, and Nebraska. Joining them are the lobbying organizations of these schools which work to influence intellectual property laws, and to obtain research subsidies for their institutions. The entry of this academic gang into the case creates the appearance of a broad public interest in upholding Monsanto’s legal position in part because these are mostly major public land grant universities. Surprised the UC would make such pro-privatization arguments? You shouldn’t be. The University of California is a behemoth in the biotech industry, and behaves more like a for-profit corporation such as Monsanto, than a public college with a broadly social mission when it comes to research and technology. UC owns more patents than any other university in the world. In fact UC owns so many patents, and files for so many new applications each year, that only a few major corporations rank above it in the yearly quest to monopolize new ideas and creations. Most of UC’s patents are medical and biotechnology-related, and many of them are leased to for-profit corporations to generate income for the different campuses, and the UC system as a whole. UC claims ownership of 3,900 different patents registered with the U.S. Patent Office, and another 3,729 patents registered with foreign authorities, according to the most recent report from the university’s Technology Transfer Office. Its even worth pointing out that the source I just cited, the UC’s Technology Transfer Office, is itself a direct product of UC’s voracious appetite to patent and sell its technological properties. Tech transfer is a full-time task run out of the UC president’s office, and through offices on each UC campus where staff and lawyers are busy finding ways to monetize the university’s knowledge production, and to penalize anyone who attempts to use UC inventions without a fee. 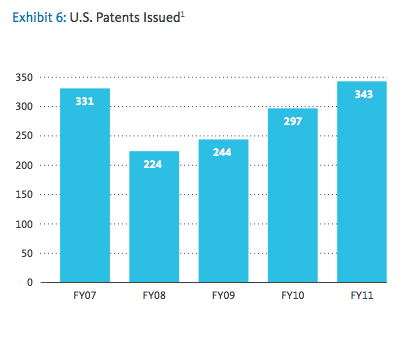 Over 1,477 of UC’s patented technologies are licensed, mostly to businesses which have commercialized them into various medical, agricultural, and consumer products. 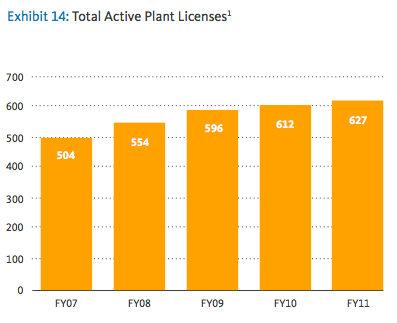 UC licenses patents to Monsanto, among many other biotech companies. Since 2007 UC has pulled in about $100 million annually from royalty and fee income on these properties, and another $20 million from settlements with those who infringe on UC’s patents. Among UC’s most lucrative patents are GMOs modifying several kinds of strawberries, a citrus fruit, and a patent for recombinant DNA used to make somatotropin, the bovine growth hormone used in industrial cattle farming. In fact in 2004 UC sued Monsanto over the company’s use of the DNA material used to produce bovine growth hormone. In 2006 Monsanto agreed to pay UC $100 million to settle the case. UC’s royalties from its bovine growth hormone patent, about $5 million in 2011, are on top of the $200 million settlement, and UC’s patent runs until 2023. UC has also sued Genentec and other lesser-known biotech and pharmaceutical corporations over multi-million dollar patent issues. UC spends about $28 million each year employing a team a outside lawyers to manage its intellectual property portfolio. Most of their work involves enforcement of patent infringement claims against companies like Monsanto. Similarly impossible to prove value-laden language permeates the other briefs in support of Monsanto. For whatever reason these corporations, including the university-corporations like UC, feel their case must rest on more than just the letter of U.S. patent law, which does read in their favor. It’s perhaps worth noting here that BayhDole25, a group founded to promote technology transfer between universities and corporations, is run by a pharmaceutical industry lobbyist and a university researcher who claims to have been “the first person to receive a patent for a transgenic organism.” The Bayh Dole Act from which they take their name was passed by Congress in 1980. It was a watershed moment in terms of the incentives it created toward further privatization of U.S. universities. Prior to Bayh Dole university researchers using federal funds were required to hand over any patentable inventions to the U.S. government. After Bayh Dole schools could take out the patents on technologies arising from federal research conducted under their auspices.